While pregnant one of the most exciting things I was looking forward too was Paige and Parker meeting Harleigh. Of course I couldn't wait to meet her but I was so excited to see all three of my babies together. It was a moment that I'd imagined in my head and one that I wish I could relive over and over again. The first to meet Harleigh was Paige. Mainly because Parker had to be at nursery for half 8 and Paige started school later. Mark stopped off by the hospital before dropping her off to school. We always knew that Paige would be an amazing big sister as she already is but she loves Harleigh so much. 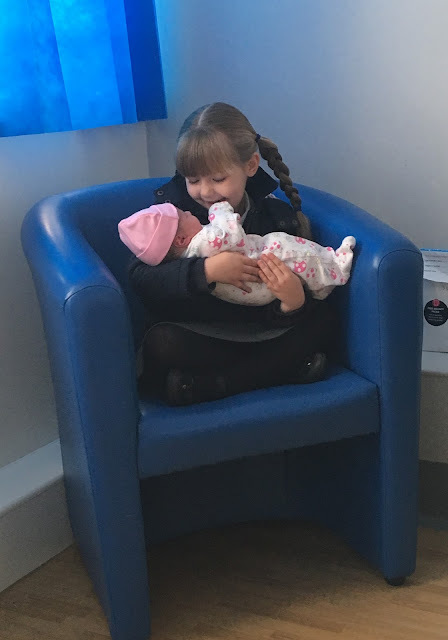 She said from the very start of my pregnancy that she wanted a baby sister and that is what she got. Paige beamed from ear to ear when she met Harleigh. It brought tears to my eyes. You could clearly see how much she loved her already. She fully understood that she wasn't in my belly anymore and that she was here to stay. She walked over to Harleigh and immediately started stroking her hand and face. Next she wanted to hold her. She sat in that blue chair and looked so proud to be holding her baby sister. I will never forget that moment. Parker came to visit after nursery and just before they let us go home. Harleigh was already in her car seat, we were ready to go. He walked into the room and shouted for me. We said hello and had a cuddle and then I pointed down to the car seat. He walked straight over to Harleigh, said her name and then stroked her head and feet. He was so gentle. We then headed home and he very proudly wanted to help daddy carry the car seat out to the car. We weren't sure how Parker would react but he is the best big brother. They are both adjusting to the new addition so well, we couldn't be prouder. How did your little ones adjust to new siblings?